I love finding alternatives to the traditional tented place card. Don't you think it's nice to sit down to something a little more creative? 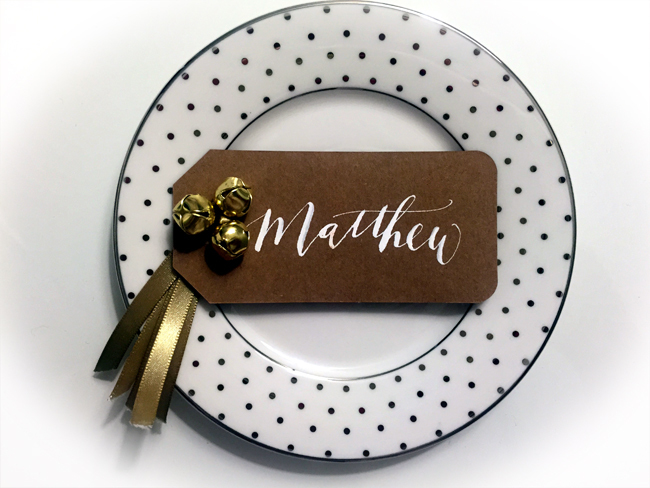 These jingle bell place cards are super easy and would be great for Christmas Eve or Christmas Dinner. I used tags leftover from the favors I was too drunk to hand out at Friendsgiving. But you can use any paper you like - a gift tag (one of these free printables) would be lovely. You just need to punch a hole in one side, thread ribbon through a few of these bells and loop them through.